Provide comfort for the family of Vincent J. Stigliani with a meaningful gesture of sympathy. Vincent James Stigliani, age 95, of Maynard,Massachusetts passed away on April 9, 2019. He was born in Boston’s North End and raised in Charlestown, the son of the late Matteo and Margaret (Orlandella) Stigliani. A former accountant for the federal government, Mr. Stigliani had a love of music and was a professional musician and union member, playing in the Boston area and ballrooms throughout New England. 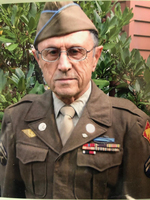 During WWII, Mr. Stigliani was a Tech 5 Sergeant in the US Army’s 157th Infantry Regiment, 45th Division in Africa, Sicily, and Italy, earning the Combat Infantry Badge, the Purple Heart, Bronze Star Medal, and various campaign medals. He fought at the Battle of Monte Cassino, and was a POW in Italy for four months before being liberated. A veteran also of the US Navy, Mr. Stigliani was a member of the Military Order of the Purple Heart, the Disabled American Veterans, and the American Legion Post #235 in Maynard. He was also a member of the 45th Division Alumni Association, and enjoyed attending reunions over the years. A longtime Maynard resident, he was a member of the Maynard Historical Society, Maynard Senior Citizens and the Drop-In Center, associate member of the Council on Aging, and St. Casimir’s Holy Name. A graduate of Charlestown High School, Class of 1942, he was a member of the Old Charlestown Schoolboys Association. He also performed with the Seasoned Singers and the Tap n Tones. He enjoyed traveling with his wife, with trips to Europe, Asia, and Central America. He leaves his beloved wife of 68 years, Constance (Ayotte). Devoted father to Mary Gunn of Rutland, Vermont, Joseph Stigliani of Hingham, and Patricia Beason and husband Stephen, of Lebanon, Ohio. He was predeceased by son, John, infant son, Matthew and grandson, Nicholas. Other survivors include his brothers, Ralph and Mike, sister Rose Theologou and her husband Peter, beloved granddaughters, Vicki and Rosie Stigliani, Meghan, Katie and Emily Gunn, as well as great-grandchildren, Kayla, Tyler, Anthony, James, John, and Sarah. We encourage you to share your most beloved memories of Vincent J. here, so that the family and other loved ones can always see it. You can upload cherished photographs, or share your favorite stories, and can even comment on those shared by others. Plant a Tree in Memory of Vincent J.